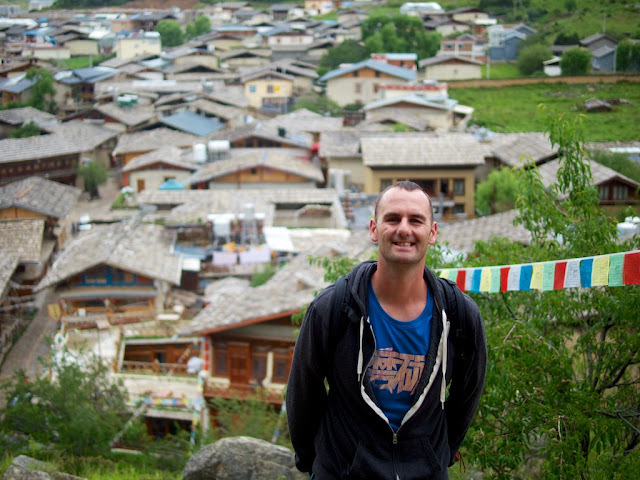 We left Tiger Leaping Gorge on a bus bound for Shangri-la. Except that there was a landslide in the gorge, so we were going to need to drive to the landslide, walk across it (yeah, while staring up at the "landslide nets" that in some places were holding more rocks up and in other cases, just hanging in tatters because the land slid through them) and get into another bus. Quite exciting, and not too well photographed as we didn't want to be those idiots who were photographing mid-landslide. That would be a truly stupid way to go (you're welcome, Moms!). Three hours later, we arrived in Shangri-la, with good spirits but no hotel booking. Our first order of business was losing a woman we met on the bus who promptly looked at the map, the street sign in Chinese and proclaimed it was "impossible!" Or, you just take a few extra minutes, line up the characters on your map with the characters on the sign, and you're on your way! Shangri-la used to be named Zhongdian, but after an international discussion about the actual location described in James Hilton's book Lost Horizon, the Chinese government officially changed the name to Shangri-la in 2001, hoping to beat the competition. 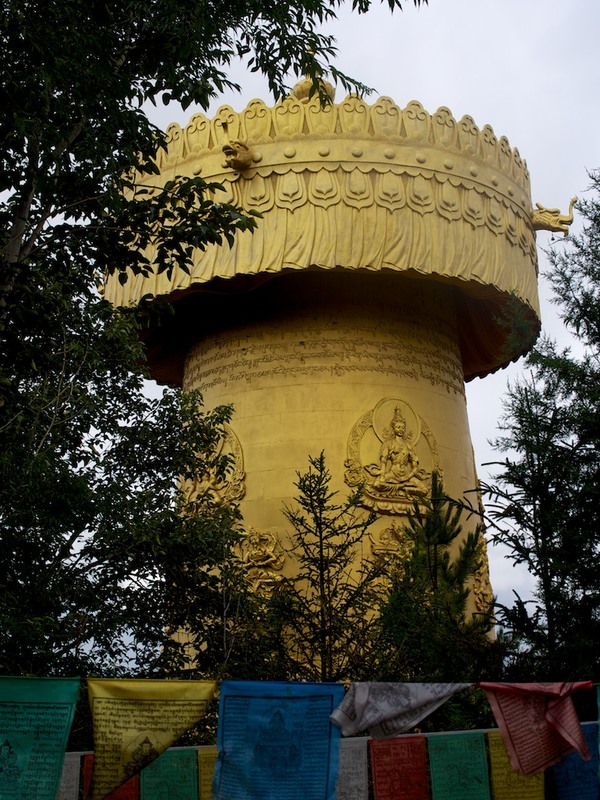 Other than potentially being the true location of a literary plane crash, Shangri-la is known for being the most "Tibet" you can get without actually paying for all the permits to go to Tibet. And what does that mean? 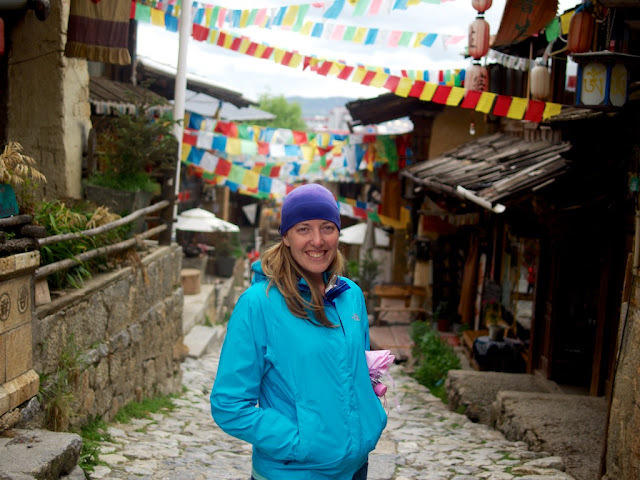 It means you can go to this cute little old town, see prayer flags over all the twisty car-free cobblestone streets and eat yak in it's many forms (cheese, butter tea, hot pot, jerky, etc). We got off the bus, oriented ourselves by lining up the map and signs and set off to find a place to sleep. We figured it was an incredibly long shot (especially during high season) but set off for the top rated hostel in our Lonely Planet guide (Kersang Relay Station), walked in, asked for a room and got the last one, and it was clean, and in our price range to boot! And there was a map of San Diego on the door. Don't take this as a sign that one should do less planning though, as other people we met on the trip did the same thing, and had to go to a dozen hostels before they found one with room! We spent the next few days just enjoying the mountain air, meandering the streets, and seeing the few budget sights. China has figured out that if you charge more for a tourist destination, more Chinese tourists will go because they figure it's more valuable if it's more expensive. We read that the most popular destination in town, the monastery, had raised its prices many times over in the past few years, and seeing as it was 150 RMB each ($25 US!) I believe it! Needless to say, we didn't go. 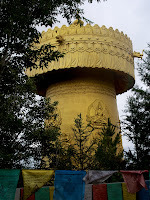 We went to the free temple on the hill in the middle of town, had a great view of the valley, and spun the world's largest Prayer Wheel. 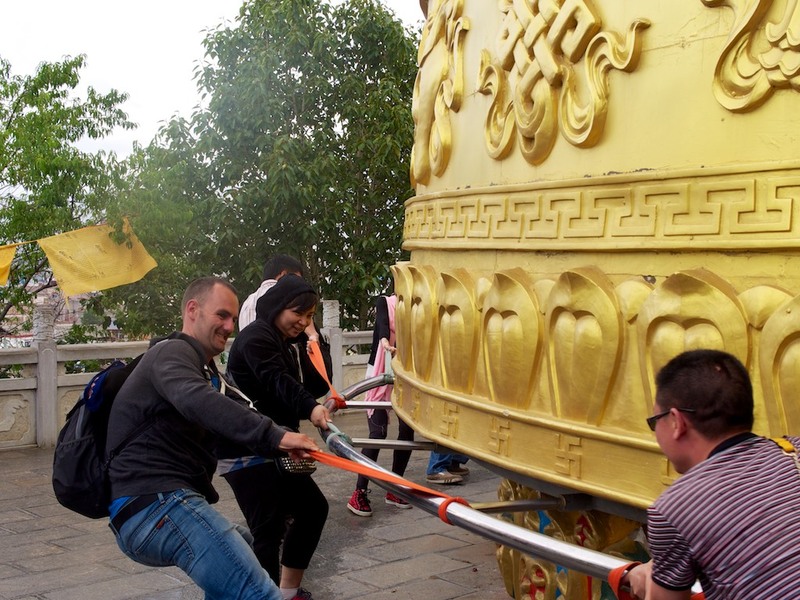 It takes about 30 people to spin the Prayer Wheel, using straps and handles around the bottom. It would be a great team building activity, because as a group (or one leader I suppose), the group has to decide when there are enough people to get the wheel spinning. Too few people and it becomes so frustrating that people leave. But wait to long for enough people to gather and people get bored and leave. It was fun to watch the process happen in Chinese, where eventually one guy would start yelling "one, two three!" (we assume) and everyone would push and pull and the wheel would spin. The local townspeople explained that spinning the wheel would bring you good luck (unless you're in the camp of believing that praying to God brings you luck, in which case the wheel won't do anything for you). 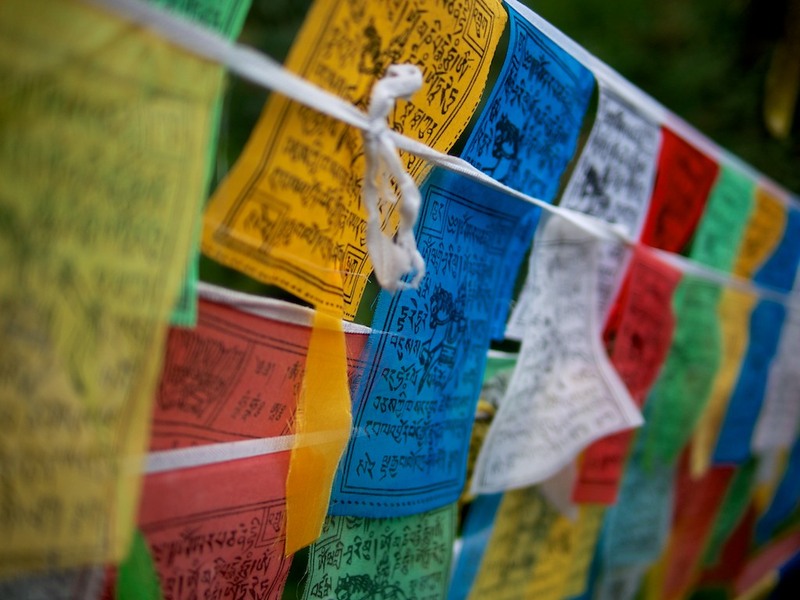 We figured we'd just get luck by any spiritual means possible…always best to hedge your bets! The other great activity in Shangri-la takes place in the main village square each evening. Music starts playing and the traditional dances start. The village gathers in a large circle (including both local people and visitors) and dances, arms flailing, bodies spinning, everyone trying to figure out who's leading and who's following. It's a fabulous activity for people who love joyful movement but have two left feet! Everyone's laughing and almost no one is any good, because there are so many bodies flailing in such a small space. Plus, there's nothing to make you feel like you've really traveled to a remote place like dancing in a Tibetan square with a bunch of villagers.